Well, it’s here. The final day of our Countdown. Is it just me, or have the past two weeks just flown by? I hope you had as much fun reading about (and watching) these cinematic couples as I had writing about (and watching) them! But wait! This isn’t our final, end of the countdown post together! As I mentioned on Sunday, I spent some time away from my laptop and “unplugged” on the weekend, so there was no post on Saturday. And as such, I owe you one extra couple. So! We’re not done yet. Consider this to be the lead up to our grand finale. But who to put in this penultimate spot? It was a tough decision – you want a couple who’s dramatic and memorable, but who won’t outshine our final pairing. But they are being featured on Valentine’s Day, so they need to have something the other couples don’t. Sultry, smoldering, eye contact, maybe? Why They’re Great Together: See: sultry eye contact, smoldering and; dance moves, sweetly romantic. Plus there’s the singing, and the family drama, and the singing, and the forbidden love… and have I mentioned the singing? These two are Romeo and Juliet – with singing. Literally, they’re a musical version of what many people consider to be the most romantic couple in the history of fiction, so how can they be anything but great together?!? 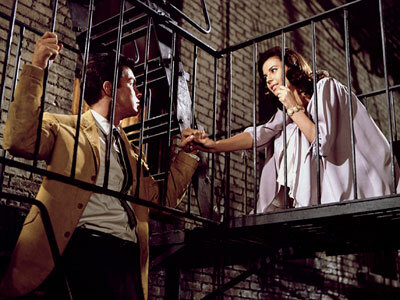 Best Moment/Quote: Of course, there’s that one song from West Side Story that people always think of when they think of this iconic couple…here’s a newer version, with the cast from the 2009 revival on Broadway. No disrespect to my beloved original film version, but can I just say…*swoon* How these two don’t fall in love every time they perform is beyond me! They’re Your Perfect Couple If: You’re willing to defy your family for your one true love. Or at least sing about it. Perfectly amazing casting for Tony and Maria! Is this version still running on Broadway??? Aren’t they adorable? I’m not sure if they’re still on broadway though.